I’m on a secret floor of Style Suites at London’s Savoy hotel, about to experience the ultimate makeover: a full day of glossing and preening in a bid to experience what Bafta guests go through on the day of the awards. Each suite – there are different ones for clothes and jewellery, hair, and makeup – holds up to 16 staff members working non-stop, operating a sort of high-glamour conveyor belt. All a client needs to gain entry is an invitation to the awards, held this Sunday (and screened at 9pm on BBC1) at the nearby Royal Opera House. Not that I have a ticket, of course. I’m an impostor playing at being a VIP, a canary down the most glamorous of mineshafts, experiencing the star treatment firsthand. 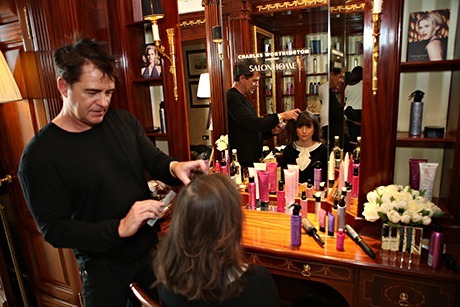 Celebrity hairdresser Charles Worthington is enjoying his sixth year in the suites. During his reign as official hair sponsor, he has helped Kim Cattrall, Emilia Fox, Alice Eve and Helen McCrory to get ready, plus plenty of others he can’t mention. “Most of the big Hollywood stars don’t come down to the suites – we go to their rooms. They usually choose to stay here at The Savoy so they’re cocooned from the paps while they get ready.” Official self-tan sponsor St Tropez (yes, really) operates in the same way, erecting a special tanning tent in male and female celebrities’ hotel rooms a day or two before the ceremony to ensure the optimum red-carpet glow. For the presumably less important Bafta attendees who do make it downstairs to his in-suite salon, champagne flows and a sort of school-dorm atmosphere awaits. “It’s such a laugh,” says Worthington. “Everyone is in high spirits. It’s mad-busy but relaxed and safe. There’s a real buzz in getting ready for such a special event”. This is not an egalitarian enterprise, of course. The highly prized 5pm appointments immediately before the ceremony are reserved for “the talent”, who need fresh and immaculate hair and makeup for the pap scrum. The early hair and makeup appointments, starting at 8am, go to the wives, mums and girlfriends of say, the best documentary short or sound engineering nominees, who then presumably have to sit around for several hours, not making any sudden head movements and drinking tea through straws. To begin with, I need to have my makeup applied. 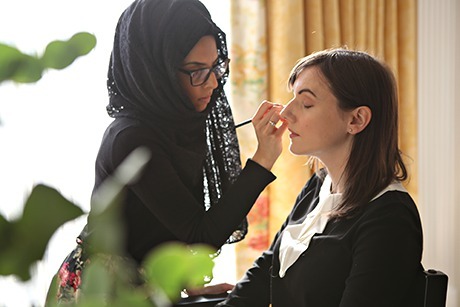 To Lancôme, where the chief Bafta suite makeup artist stands before a counter that looks as if it has been lifted straight out of a luxury department store beauty hall. She suggests a dark, smoky eye and flawless skin, except when she’s finished I appear to be wearing much less makeup than I’d wear for a drink with friends, never mind on a world stage. I ask her to ramp up the lipstick, which she does very nicely. Next, I’m with Worthington, to get my hair styled. For my Bafta look, I request a sort of 60s up-do. Worthington gets to work by blowdrying my lank hair with his Bafta special edition volumising cream. Lancôme, next door, has made a Bafta blusher too – both brands mark their official involvement with the event by making special-edition products available to the uninvited masses. After bulking out my locks, Worthington fashions them into a retro debutante’s beehive, and his assistant props it up while the boss plunges in approximately 7,000 pins like a game of Kerplunk (Worthington also has a team backstage on the night, to handle any loose hair or other related emergencies). The resulting style is awe-inspiring, masterful and renders me entirely unfit for ordinary life. It’s a hairstyle that, in 2014, cannot exist anywhere but the Baftas or a rep production of Dangerous Liaisons. Just as I’m feeling faintly ridiculous, my colleague Zoe Williams pops in unexpectedly, wearing a floor-length gown and implausibly enlarged hair. We suddenly bear the mortified expressions of suburban neighbours who have just bumped into one another at Spearmint Rhino. Anyway, in all honesty, hair and makeup is a busman’s holiday for me and I’m itching to try on some dresses and jewellery. The fashion suite is filled with beautiful gowns from Selfridges, which loans and sells dresses to guests from the suite, though the big stars and presenters are likely to have their outfits sourced straight from the designers months in advance. In theory, I can take my pick. Except literally only one of the dresses has sleeves and my arms look like ham without them, so the green sequined knee-length Jenny Packham it is (price tag: three grand). In fairness, I can feel every penny – it is perfectly weighted and cleverly cut. Naturally, any frock is merely the backdrop for full-on Bafta diamonds, so I am ushered into the Asprey room to be shown a priceless selection. We go for chandelier earrings (£750k), an extraordinary daisy-shaped ring made up of naturally candy coloured diamonds worth £1.6m and a weighty clutch bag priced at a mere £6,500. As I slip on the kind of jewellery some people dream of wearing, I find that in fact, I feel a bit sick and jumpy. I wander to the mirror and a man follows me. I go into the corridor for a photograph and he comes with me. “We have security guards on the Bafta red carpet,” explains the Asprey’s staffer. “And also in the ladies’ room at the ceremony. It’s not that we’re worried about celebrities stealing jewellery, of course. But lots of women instinctively remove rings at wash basins and we can’t risk them leaving our jewellery anywhere.” The thought of nervously going for a pee under the watchful eye of a security guard makes the whole thing seem rather lacking in the fun I’d imagined. I don’t feel special and important, more like a disaster waiting to happen. I’ve no idea how the stars at Bafta night can even begin to relax while wearing enough jewellery to bail out Greece. I’m extremely relieved when it becomes very clear that it is time to hand everything back. I love the fun and momentum in getting ready to go out, and generally jump at the chance to attend something really special, but by the time I’ve finished at the Bafta style suites, all I want to do is take down my hair, collapse on my sofa with a cup of tea and inhale my Hotel Chocolat goodie bag. I certainly feel quite incapable of sitting through an event, with all eyes on me, waiting to pass judgment on the size of my rocks, the quality of my skin, the perceived flaunting of my curves. This stuff seems like fun – and it is – but it also feels too much like hard work. I could do it no more than once without resenting the freedom to just put on a nice dress, apply some lippy, call a cab and wait for my name to be pulled from a golden envelope.